Researchers develop a new, more stable method for synthesising nanoparticle lattices using DNA. While DNA is most well-known for its biological role as a carrier of genetic code, researchers have also made use of its predictable base-pairing interactions toward the assembly of nanoparticles into highly ordered superlattices. One limitation of this methodology, however, is that the structures collapse outside of solution or under conditions where the DNA duplexes dissociate. 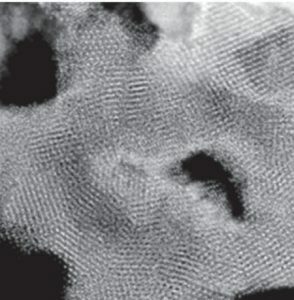 A TEM image of the silica-embedded nanoparticles forming a stable lattice. Now, in new work, a team of researchers from Northwestern University in the USA has reported the development of a method to transfer the superlattices from the solution phase to the solid state by silica embedding. The encapsulated lattices are stable under vacuum, in a variety of common solvents, at elevated temperatures, and even under conditions where the DNA is degraded. This embedding technique removes many of the limitations in stability inherent with using DNA as a building material, rendering the ordered arrangements of inorganic nanoparticles more amenable to standard characterization techniques and will thus allow for better study of their unique collective properties in future studies.